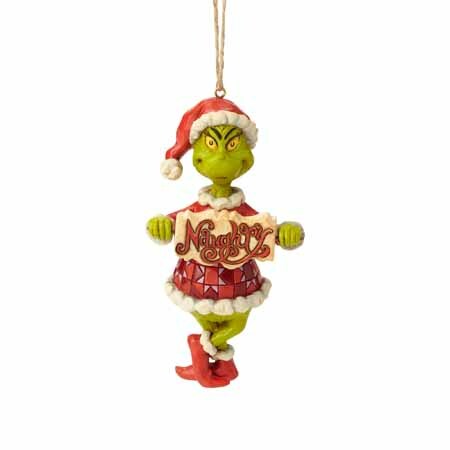 Grinch with Naughty and Nice Sign | Dr. Seuss Figurines & Ornaments Figurines | One Price Low Flat Shipping! From the Grinch by Jim Shore Department 56 Holiday Collection, Grinch Naughty and Nice Sign Rotating Ornament. Made of hand-painted stone resin. Measures 4" tall. Packaged in collectible Enesco Jim Shore gift box. Are you feeling naughty or nice? Capturing the charm of the Grinch's sometimes mischievous personality mixed with the warm soul he really is, this interactive ornament lets you spin the sign to declare your mood of the day. A perfect capture of Dr. Seusss Grinch, the handcrafted design is sculpted from stone resin and hand-painted for an artisanal finish.